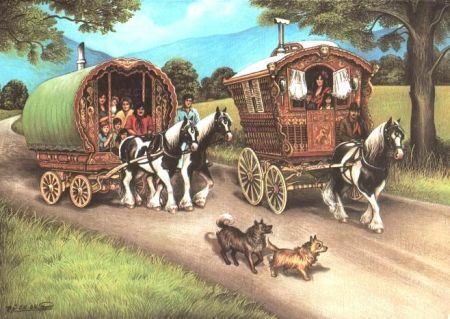 In our gaming life as our Characters be it in D&D or any RPG we use Caravans, those collected means of safe transport from one major city to the next stopping off at small towns along the way to trade, drop off and pickup passengers. Whether you Are a passenger or a paid employee of the caravan owner. We love these wheeled wagons of wonder. What goes on with these traders and their travels when we aren’t looking. Here I,ll try and show you. 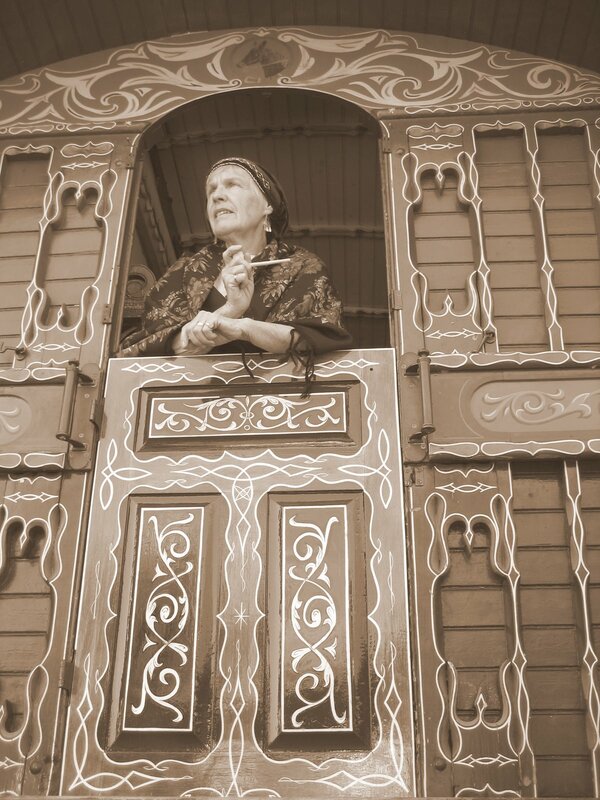 People of importance and note aboard the Caravan. He/She could be the owner but never assume this. They also could just be hired to do a job but remember they get well paid for a job completed. Although if a caravan is lost they will not fear their bosses wrath to much. If they are the owner then they will possibly fight to save it by their hired guards side. Trade Guilds own many caravans and make it difficult for any independent trader. Most of the time its undercutting prices but they charge for the extras like food. So if you are new to this form of travel, seek out the small companies. You may think this person should be a long way down the list but fear the hungry man for without a cook to keep the employees happy then it will soon loose staff to the better fed trade companies. Its the cooks job to calculate the provisions needed for the trek to the next supplies. They always welcome extra food caught by passengers. This person is in charge of the well being of the animals that haul the loads and Caravans. Be they cattle, horses or tamed beast. They will make sure there is enough feed and water for the journey. Also watching there general health as a sick animal is unless to any road train. Also having some skills as a smithy for shoeing but also for general caravan repair. Not all Caravans have a Scout. As most employers see them as an over spend. But those that do use them find them beneficial. They will find safe routes avoiding danger and difficult trails that may be blocked from weather, landslides and beast movement like Orcs on the march. They carry a horn with them at all time for signalling danger. They will scout ahead each day before sunrise. These colourful people usually travel with Caravans for their own benefit. As this is the easiest and safest way to travel. Occasionally a caravan owner will hire an entertainer for his own benefit and piece of mind, that a calm crew is a happy crew. These come along for the comfort of the men folk and to sell their wears as they go. The Owner tries to stop these women coming but in the end they serve a need. Its also good for moral. They help around the camp. Willing to cook and clean for a price if that’s what you are after. A little touch of home. Priests or Acolytes travel for free. As they are a good source of well being and calm among the travellers. Most have skills in healing and with a donation to their church will be willing to help. Most Caravans will have and keep regular Guards. These are possibly the highest paid of the Caravan crew next to the cook. These will put their lives on the line for the safety of the Caravan its stock and its passengers. One Guard in particular will be designated Captain and may get a gold more than the others. He will organise and lead the guard but also it his job to physically protect the Master. Also know by other names most notable is Witch. 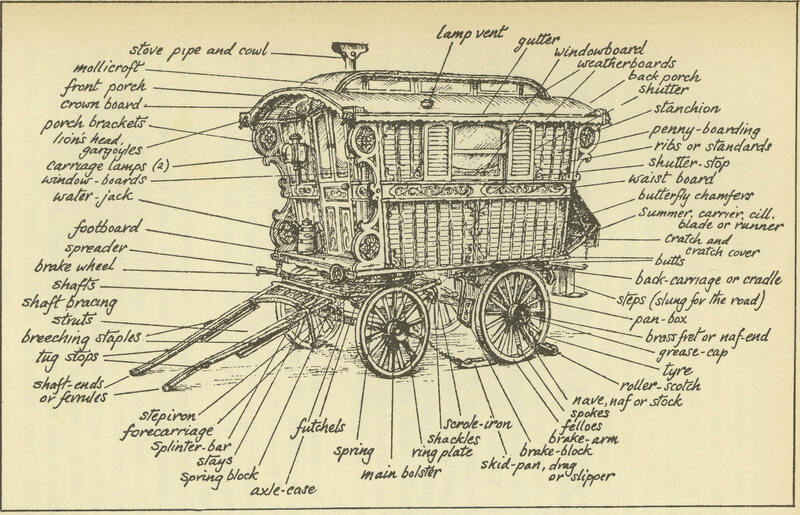 Not many caravans have a witch. But when they do they have all kinds of knowledge to pass on be it about the local areas Forna and Flora. To herbs and poisons. They also may have knowledge of magic. If a caravan owner chooses to have a wise one along they can be expensive. So if one chooses to come along they are not charged. But they do seem to travel at the back beyond the guards and alone. Now comes the paying passengers and the trade goods. Also some crews will bring their families with them attaching their own caravan to the line up. Time to look at the Caravan its self. Most are constructed from wood and metal and drawn by animal. With a sturdy wooden roof be it flat or arched. Some are barrel-shaped with a smooth curve from one side to the next. Painted in vibrant colours, all kinds of decoration from flowers to epic battle scenes of some hero passed. Horns hang from a peg on the side of every caravan for use in signalling danger. Steps lead down from the rear door and Lanterns hang from the roof. Lit at night to keep in view and count at a distance. The lead Caravan has a high driving seat to allow a good view of the road ahead and immediate surroundings. Its living space is the best kept and luxurious, with cushions and carpets throughout. Then next is usually the coach that carries the stock and trade goods. This one is more secure. With no windows and a heavy lock upon the rear door. Metal plates can also be found nailed to the sides and the underside. Shields hang along the sides and can be retrieved and used when needed. The wheels are protected by used shields. Any number of Caravans can now make up the most of the road train. If they are owned by the trader then the caravan has a uniform look be it the colour of the paint work or a uniform for the crew. A lite loaded Caravan is used for paying passengers but most will travel happily with one or more of the crews families. Placed somewhere in the midst is the food and water caravan. This will carry living food like chickens and small pigs also a goat for its milk. Dry goods and vegetables are stored in sakes and crates. Water is contained in Barrels attached to the outside of the caravan for easy access and refill. The amount of food stock carried depends on the journey time to the next town or trade post. The final Caravan is used for the Guards that are hired for the caravan protection. Not the best kept but then the guards get the best pay. 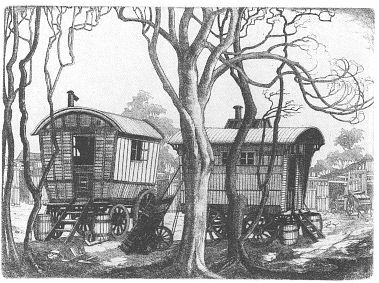 Dogs also accompany a caravan for protection and for their heightened sense of danger. Large but untrained is the cheaper option. Two to four is usual. A typical day with a Caravan road train. Typically a Caravan will not depart before sunrise. So during winter months it makes for shorter travelling days. They will move at a steady pace as not to exhaust or hurt the animals. They will generally stop once at around noon then make camp just before Sunset. It would have to be an extra ordinary reason to travel at night. Food comes within the price of your passage. So no extra provisions are needed. Hot meals are served at noon and supper camp with a hearty breakfast in the mornings. A large pit is dug when the caravan first stops in the evening, between 1 and 2 feet deep with a circle of stones around the edge and a campfire is lite within. This keeps it as hidden as possible from a distance. Food Is cooked above, hanging pots from a chain and hook upon a metal tripod. The hot stones are also used to warm the caravans on chilly nights. The hole is then filled in in the morning before departure. There is an obvious hierarchy within the caravaners and their teams. If you join with your own caravan you join at the end of the line just in front of the guards coach. Last in usually means last served. Don’t feel put out or insulted by this its just the way they are. It is seen that if you have any fighting skills and the Caravan is in danger it is your duty to help protect the Caravan and its occupants. Most towns and villages will look coldly upon any who think this is not the case. Getting work in any towns from then on may become difficult.